Peter Lehrach is looking for a half dozen volunteers to take a nice walk along highway 74 on a Sunday morning and join him for brunch. Please email him if you can help on Sunday, October 14. 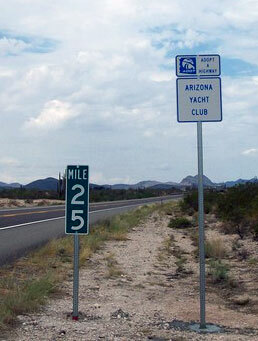 Next time you drive Carefree Highway to Lake Pleasant, watch for the Arizona Yacht Club signs. This one is at mile marker 25. You’ll see another when you’re headed the other way. A bunch of us earned that sign one warm June morning by filling lots of purple bags with nasty roadside trash. Credit Peter for pushing the “adopt a highway” idea, gathering the clean-up crew, collecting the vests, gloves, pokers, and bags, sitting through the required training exercise, filing the paperwork, following up (through a change of DOT offices), and celebrating the arrival of the sign in August.